Patentability of antibodies in Europe, read Nature Biotechnology article. 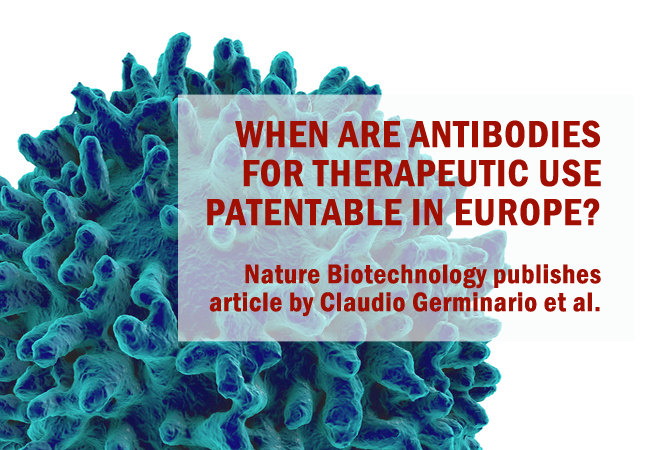 Patentability of antibodies for therapeutic use in Europe by Claudio Germinario et al. An article co-authored by our partner Claudio Germinario, published in May 2018 by Nature Biotechnology, explains clearly, schematically and in practical terms the general guidelines on the patentability in Europe of inventions arising from research in the field of poly- and mono-clonal antibodies. Interest in the potential applications of antibody-related inventions in the fields of immunotherapy and diagnostics is growing. So are efforts by researchers, who often seek advice on whether the outcome of their investigations will be patentable. Patentability of antibodies for therapeutic use in Europe, an article published in Nature Biotechnology Volume 36 Number 5, May 2018, co-authored by our partner Claudio Germinario, helps to provide clear, practical guidelines. Monoclonal antibodies (mAbs) are at the forefront of innovation. They are lab-created antibodies with the ability to link to a highly specific antigen. That ability is useful in many areas of science: in diagnostics or forensic science, the mAb’s exclusive knack of linking with a certain substance can make it work as a sensor of that substance; in chemistry mAbs can be employed to isolate a molecule in a mix of compounds; in medicine they are used in the treatment of autoimmune diseases, exploiting the specific link they establish with a certain antigen/receptor; in cancer treatments and post-surgery rejection therapies, mAbs can modulate the immune system’s activity to destroy certain pathogens. Antibodies have been patented for years. But what about antibody-based inventions such as a monoclonal antibodies? Are there specific rules concerning their patentability? That’s not so easy to find out for a researcher, who will obviously have a hard time to extracting from case law the principles that are relevant to such a specific area of activity. The article authored by European patent attorney and former European Patent Office Board of Appeal member Claudio Germinario, together with academic researchers Bertoli, Rampinelli and Cini, helps by providing researchers with much-needed clear, schematic guidelines showing when a monoclonal antibody related invention is patentable and when it is not. This is done by means of a table summarising rules and principles established by the European Patent Office concerning patentability of antibodies for therapeutic use. A list of practical examples illustrates the most typical cases in which those rules principles are or are not satisfied. The article therefore quite literally answers the questions on patentability that arise most frequently from inventions involving monoclonal antibodies.